September 24th, 2008 was the day the first batch of Nikon D90 digital SLR cameras was released to impatient customers in Malaysia. Some reportedly got their units on the Friday of the previous week, but that was just a handful of them. Well, I got my unit on September 24th, 2008, and the time was 7.30pm. 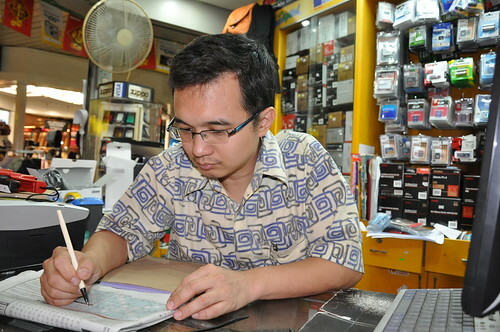 Here’s a mug shot of the owner of the camera shop I bought my D90 at. I bought the D90 kit, and used the kit Nikkor 18-105mm lens for this image. Click the photo to view the image at full size. This was the first shot taken after entering the required settings such as language, time zone, date and time. And it was shot in full automatic mode too, which meant that the flash automatically popped up. I like the fact that the camera automatically chose ISO 800 in order to balance the flash illumination from the camera with the ambient lighting. EXIF reports the Flash Sync Mode as Front Curtain, and the Flash Mode as Built-in, i-TTL BL. The factory setting for JPEG mode was Normal, and I did not change that when I took this photo.